Cool! I mean hot! Or that is... haute! My book, Careers for Your Cat, just received the "Haute or Not Approved" product award from Haute or Not Pets! The book was chosen as "one of the wittiest, funniest, and hautest cat-centric books this year." The "HorN" Approved product award is presented by Haute or Not Pets, the destination for all the latest and greatest in the pet world. 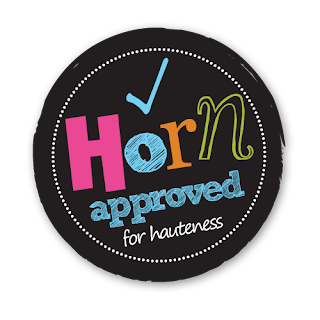 According to the Haute or Not Pets website a "HorN" approved product means it is "simply the best of the best, hautest of the hautest, thing of its kind, available on the market today." Lil' Fella off to fight crime. No. No. Let's start again (crumbles up paper). 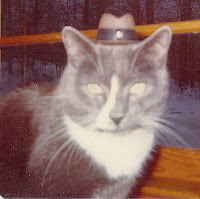 I want to thank my childhood pal and cat, Lil' Fella, for inspiring me. He demonstrated that cats can have successful careers. My grey-flannel kitty went on to become a NYPD detective--and made me proud. I especially want to give a big thanks to Haute or Not Pets for this honor. Lil Fella is so cute in the photo! Congrats on the book award!!!! No surprise here!! I have one question, what took them so long to give this well-deserved award?????? WOW! Congratulations, that is wonderful and I'm so proud of you! Hey, congrats too on the fundraiser for Janine, that's darn exciting too! And HUGE thanks for your kind and generous offer to feature her this Sunday on your Careers for Your Cat Facebook page! We're always grateful for help getting the word out about the adoptable kitties, so this is awesome. Congratulations - this is a great achievement!